Walter Richard Sickert is an anomaly amongst the artists that I like. I find his darkness compelling, he draws you into a scene and leave you there. His paintings are often ambiguous and unnerving, they give you an uncomfortable feeling, as though something is not quite right but you can’t tell what. Jack the Ripper’s Bedroom (1907) is an extreme example of this. I get a similar feeling from a good horror movie – a rare thing. Colours and textures blend into one another and create ghostly forms, the light doesn’t allow your eyes to focus, so you can’t figure out what is going on. You know something or someone is there, but you are denied knowing anything. Despite the lack of detail and light, a strong geometry grounds the composition. We can make out verticals of a doorway and a back of a chair in the foreground, horizontals of the Venetian blinds at the back. The room was in Sickert’s house at 6 Mornington Crescent, and apparently his landlady told him that she suspected its previous tenant of being Jack the Ripper. In the centre of it all is an ominous figure, which I always assume is Jack the Ripper. Perhaps the dark outline represents spirit of a murderer, inhabiting the room and all tainting those who reside there. The shape reminds me of Nosferatu (surely the most terrifying creature ever conceived), peering through the slats, watching his next victim. 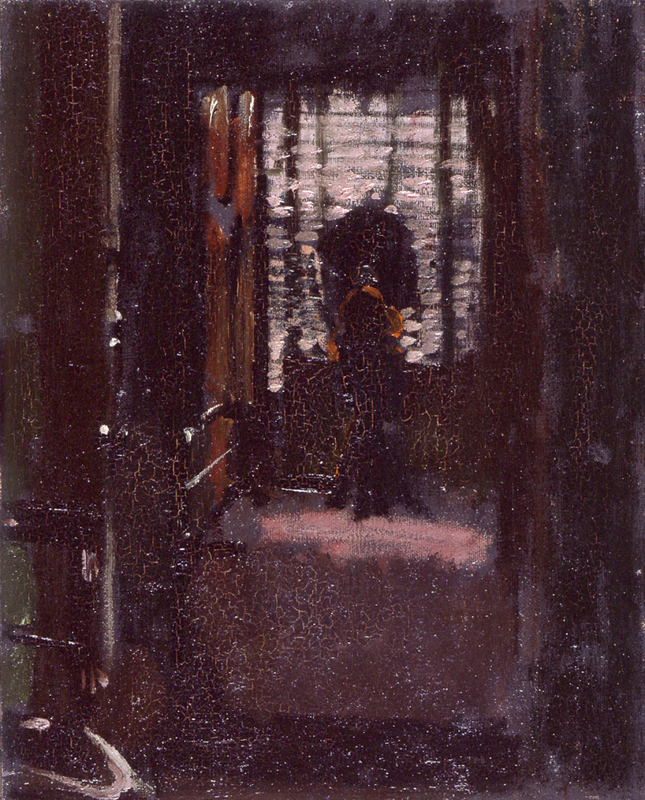 The use of almost black paint and a palette of reds, from crimson through to pink, reflect Sickert’s apprenticeship under James McNeill Whistler – the king of symphonies in colour. But this painting has a sinister subject, a quality that was to become idiosyncratic of Sickert. He was a key figure in one of the most influential, avant-garde British art collectives (The Camden Town Group), yet remained somewhat individualistic. His work are often psychologically complex. It is perhaps his background as an actor that necessitates an element of the theatrical. It is the power of curiosity, when in a film a protagonist ventures alone into a dark basement, or opens a door knowing something evil is behind it. It the pull of the Gothic, a fascination with the macabre and a curiosity that defeats natural instinct. The cracked surface of the painting makes us want to probe deeper into the painting, which simultaneously makes it hard for us to get out. And that is what a good horror movie does; it creates all the tension and fear, but keeps the source of it hidden from sight.